Crowds come for a roasting at this Cantonese duck and pork specialist on Bayswater’s high street. Gold Mine is so renowned for its roast meats – which can be seen hanging in the open kitchen by the front window – that diners from near and far can be seen tucking in here, both local students and visitors from Hong Kong. The dining room seems to have been decorated on a tight budget and, as with many Chinese cafés, red (symbolising good fortune) is a popular colour, appearing on carpets and chairs. Large gold-framed pictures of vintage Chinese scenes add a cheery note. Unsurprisingly, top marks go to the Cantonese roast meats, especially the duck and char sui (barbecued pork). Flavours are big, and dishes can be oily. Thick-cut pieces of deep-fried squid arrived with a whopping amount of garlic and chilli. Equally hearty was the ‘house special bean curd’, which turned out to be pei pa tofu served with shiitake and baby pak choi in a dark soy sauce. Staff tend to be chirpy and attentive. If you’re in the area and after no-frills Cantonese food, this is a little gem – though its next-door neighbour Toa Kitchen is better. Sometimes, I get a little homesick. I crave the typical Chinese restaurant meal that I’d have with my parents in Sydney where they order all the special dishes that are "not on the menu”. Gold Mine reminds me of those bustling restaurants in suburbs that cater to the local Chinese community. 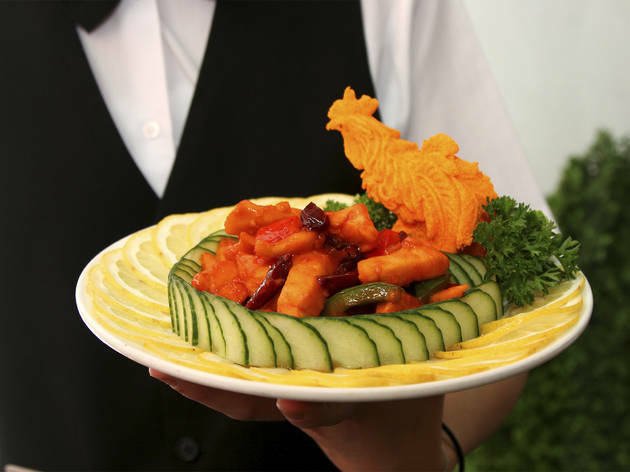 Speaking Cantonese or Mandarin is helpful as the waiters and waitresses will know exactly what you’re after (absolute freshness) and in most cases give suggestions and recommendations that aren’t necessarily on the menu. Gold Mine is no exception. Their most famous dish is their roast duck. it’s fatty, full of flavour and sells out very quickly, so if you’re going for dinner, make sure that you go early and literally order that first as you walk in the door so you don’t miss out! I ended up taking away the leftovers, making a duck fried rice with the meat at home and using the carcass and fat as a base for my ramen. Truly a gift that keeps on giving! One of my favourite nostalgic parts of the traditional Chinese restaurant meal out is that they serve you the house-made soup (this time it was a pork, watercress and apricot kernel soup) at the beginning of the meal and a fruit platter at the end - usually on the house, but not always in the more modern restaurants. The steamed fish is a homey favourite - my mother would usually make this at home at least once a week, if not more. The fresher the fish, the tastier the flesh, the silkier the texture and the soy sauce brings out its sweetness. The flesh of the fish should break away in chunks and not disintegrate. 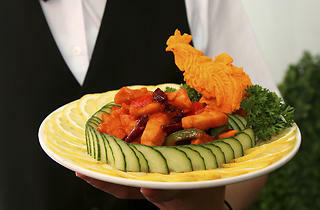 Pei Par Tofu (琵琶豆腐) is a dish named after a pear-shaped Chinese lute which is what the tofu dumplings are shaped in and then fried and is served with vegetables and a brown sauce. My family often orders the sauce to be on the side so that the tofu does not become soggy sitting in the sauce, which also goes deliciously with rice. The tofu could have been a little crispier, however, I was glad to see that it wasn’t swimming in the sauce. The seafood vermicelli noodle hot pot was okay if a little oilier than I would have liked. Overall, solid place for Cantonese food and I’ll definitely be back to satisfy those cravings and try the rest of their menu. Tip: be sure to ask the waiter what Chinese vegetables and or fresh fish they have got in on that day to ensure that you get the freshest ingredients on your table. Dimsum is not what they're well known for but their roasted duck. Personally I thought it was nice but unsure why it was being raved by others. The cheung fun dough was outstanding. A must order, but the rest of the dimsum dishes were mediocre. Yes, you're able to dine in large groups but restaurant felt cramped when every table is filled. Slightly uncomfortable feeling and service was abrupt and borderline unfriendly. It was horribly packed - not sure if this was the usual or because it was CNY festive season. Didn't make a difference if you've made a reservation in advance because all it meant was you were able to jump the queue. They won't even seat you until everyone turns up. Every time I come to Gold Mine, I'd definitely order their roasted duck. Apart from that, this is the place to come with a group of friends or family, order a variety of Chinese stir fries and share around the table. The food is generally good here.